The simple rules for drawing trendlines are: 1. For uptrends, draw your lines through the troughs. 2. For downtrends, draw your lines over the peaks. 3. For support and resistance areas, use horizontal lines It is also good practice when drawing trend lines to first see if you can identify a channel pattern. This will give you some idea of the boundaries within which the security is likely to remain. The other critical rule when drawing trendlines is, that it cannot be recognized as a valid trend unless the line touches at least 3 points. 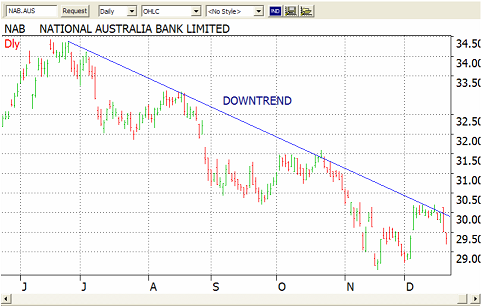 This would be three troughs in the case of an up trend or passing over three peaks when identifying a downtrend. The more points that it touches, the more valid the trendline is. 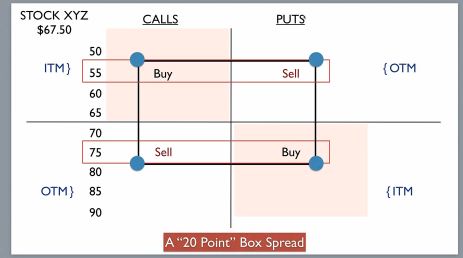 In the case of a channel, you also need at least three points, but two of them being at one side of the channel and the third at the other. A downtrend works the opposite way. Here, the bears are in control, driving prices to lower peaks and lower troughs. Those who are bearish on the security wait for the first rally, which comes when bottom feeders enter the market. It comes up a little and they feel the pressure to sell at a price that is less than which they would like, but fear is driving them to take what they can. So the bears come back into the market, driving prices further down. 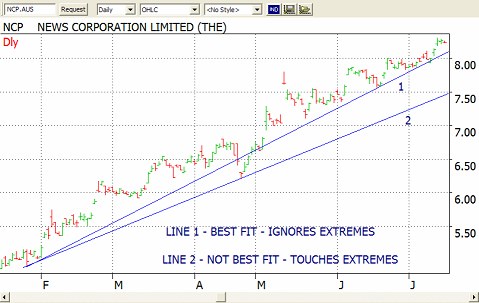 When drawing a trendline, you will sometimes need to ignore some extreme moves. You can draw the line through these extremities if it makes the best line but there will be times when it is more appropriate to run your trendlines through areas where there is the most price action. Below, we have an example of how a line of best fit works. 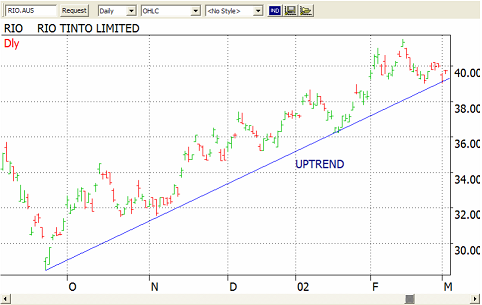 An important feature to be aware of is how steep the slope of a trendline is. The gradient measures how strong the current trend is. So a sttep up slope indicates the dominance of the bulls over the bears. You will find that steep sloping trendlines usually cannot last. It reveals extreme emotion and trends like these are often followed by a steep reversal. In many cases, the underlying security will fall back to settle at another trendline which is not so steep. Stock market trend analysis is about identifying smaller trends within larger ones and this can be a key to big profits. Trading in the direction of the weekly trend is like swimming with the tide. Trading against the weekly trend is like swimming against the tide. Which would you rather do? If you first identify the weekly trend and draw your lines as per the above, then finding those short term option trades you need on a daily chart have a much higher probability of success. Now, if you find a weekly trend that is also in harmony with the monthly trend, then you're really onto something. If the monthly, weekly and daily trends are all pointing in the same direction then the probability of the trend continuing has increased yet again. 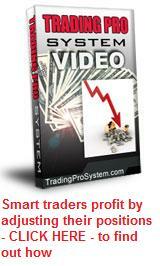 One of the best allies I have found in identifying these types of trends is Market Club. They have a scanning service which covers the US, Canadian and Australian markets over a range of different security types - and identifies securities which are strongly trending. They call it "trade triangles" because these three important trends (monthyly, weekly and daily) are all in alignment. If you don't have access to a service such as Market Club, here are some guidelines for identifying weekly and daily trends. For short term option traders, use a weekly chart over a period of 6 months and draw your weekly trendlines, then using a daily chart over 3 months, draw your daily trendlines. Always check your weekly trends before conducting your analysis on the daily charts. As already pointed out, trends can exist over different timeframes. 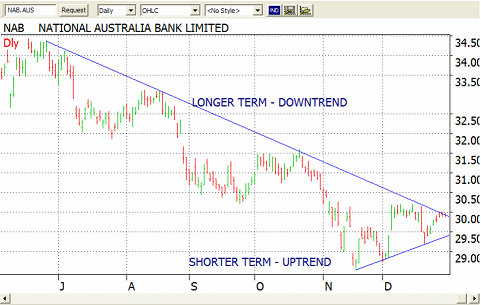 The chart below shows a longer term downtrend with a short term uptrend. Be aware of the intersection of trends. Usually the longer term trend will prevail but not always. Wait for confirmation before entering a position. Many times you won't always see an obvious trend. As with many stock market trend analysis patterns, they are easy to see in hindsight. As we're looking at the right hand edge of the chart, trends are sometimes hard to identify. If you don't see an obvious trend either up or down, it's quite possible that the security is in a sideways trading range or a channel. It may even be all over the place. In such cases it might be best to just skip this one and look for other high probability trades. There is no need to invent trades. There are plenty of real ones out there.